Head of Muslim leaders in Israel calls Chief Rabbi to denounce 'disaster' and express hope arsonists will be found and prosecuted. 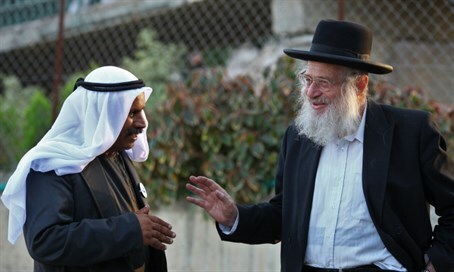 Sheikh Mohammed Kaiyuan Abu Ali, the chairman of the council of Muslim religious leaders in Israel, spoke with Israel's Chief Ashkenazic Rabbi David Lau on Sunday after a tent in Givat Sorek housing a synagogue was burnt down. Located near Karmei Tzur in Gush Etzion, the synagogue’s Torah scrolls were among the holy books burned in the attack. During their conversation, the Sheikh condemned the arson, particularly the burning of holy books, noting, "In my name, and on behalf of all imams, we condemn this act and hope another disaster like this doesn't happen again in any holy place." "We hope the perpetrators will be caught and that they will be punished to the fullest extent of the law," he added. Condemnation continued to flood in Sunday from Israeli politicians, Judea-Samaria residents and international Jewish groups. Defense Minister Moshe Ya'alon (Likud) responded on Twitter: "Seeing holy books burnt and a synagogue destroyed is insane. Those who teach hatred of Jews are responsible for this heinous act. We will find the arsonists and prosecute them." Knesset Chairman Yuli Edelstein (Likud) also blasted the "barbaric" arson, attributing it to incessant incitement against Jews and calling on the international community to "condemn it without hesitation." The synagogue, which was established to commemorate the memories of Naftali Frenkel, Gilad Sha'ar and Eyal Yifrah, was set ablaze by unknown assailants on Saturday. Karmi Tzur residents allege the perpetrators collected a pile of prayer books and set them on fire, causing the entire tent to burn down. Judea-Samaria District Police have opened an investigation into the arson, with evidence leading to the nearby Palestinian town of Halhul.